I just wanted to be fair to YTL when I said about ERL. 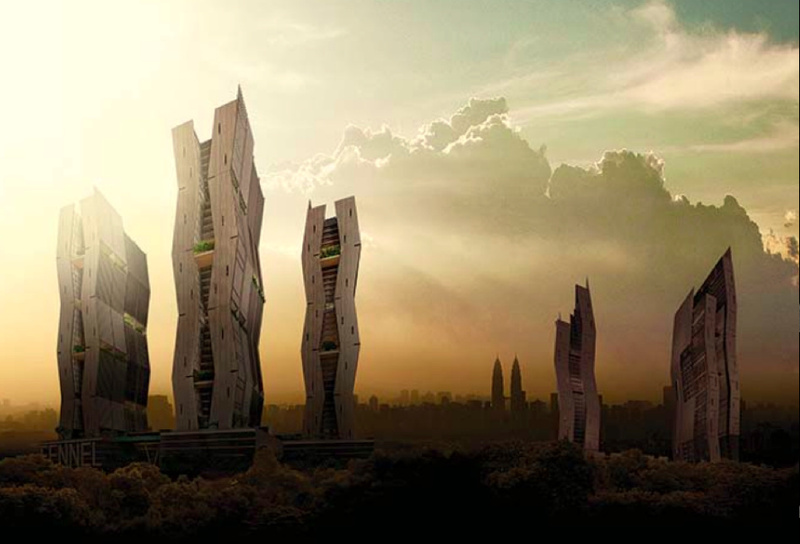 Apparently most of the projects given to YTL were either overpriced or innovative. a) IPP: the first Infrastructure Project Company listing that was financed by ringgit is actually funded by EPF 100%. b) ERL: the runaway success was actually subsidised through RM5 of every passenger airport tax paid by travellers going through KLIA. c) 1Bestarinet: the first virtual lab throughout school in Malaysia that cost taxpayers around RM3 billion was actually funding the commercial expansion of YTL’s YES 4G network. 1. Tan Sri Francis Yeoh of YTL Corporation has made clarification on the report that he has urged the government to free itself from the constraints of “crony capitalism”. In his rebuttal, he has actually defended the present government’s concerted efforts to introduce more open competition and encourage greater transparency in business. 2. It would be absurd to think that remarks could be uttered by someone who became cash rich thanks to the government policies. 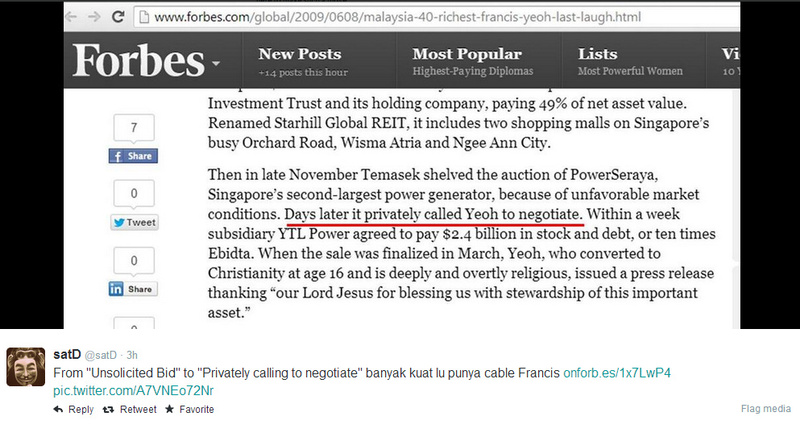 So rich that he can acquire foreign assets which accounted 85% of YTL’s business. 3. However, he has not clarified his remarks that he has to kowtow to the prime minister before any deals and has to see them even after he has won the deal. In fact, according to him, that was the main reason why he decided to turn west. It’s simply because in those countries, he can abhor corruption, practice meritocracy and stand for the rule of law. Did he? 4. The purchase of PowerSeraya from Temasek in 2008 was approved when YTL Power International put forward an unsolicited proposal only after the tender process was closed. Maybe in Singapore that’s is a meritocracy. 5. When YTL acquired UK Wessex Water Services in 2002, it has to pay £1 million for the ‘consultancy fee’. Of course that is not corruption. 7. If he believes meritocracy has no place in Malaysia, why did he lose to 1MDB in RM11 billion Jimah Plant contract, despite the fact that he was teamed up with the Sultan of Johor? Unless there is a transparent and coherent regulatory framework in place that denied him from getting the job. 8. If he thinks that everything in Malaysia was done and shrouded in secrecy, he can explain to the public on recent multi-billion ringgit Track 4A power plant project in Johor that has been awarded to his company via direct negotiations. 9. As for his assertion that non-Bumiputera small and medium enterprises (SME) “absolutely have no chance” to even fight “for the crumbs” in Malaysia, let the number of these companies in Bursa Malaysia speak for itself. 10. Admittedly YTL Corp has done a good job in bringing world class services to Malaysians at a lower price. For example, who could possibly think a 58km journey from the city centre to KLIA via high speed rail will cost only about £6. In contrast, a ticket to ride on the British high speed rail from London Paddington to Heathrow is about £15. 11. But facts are facts. 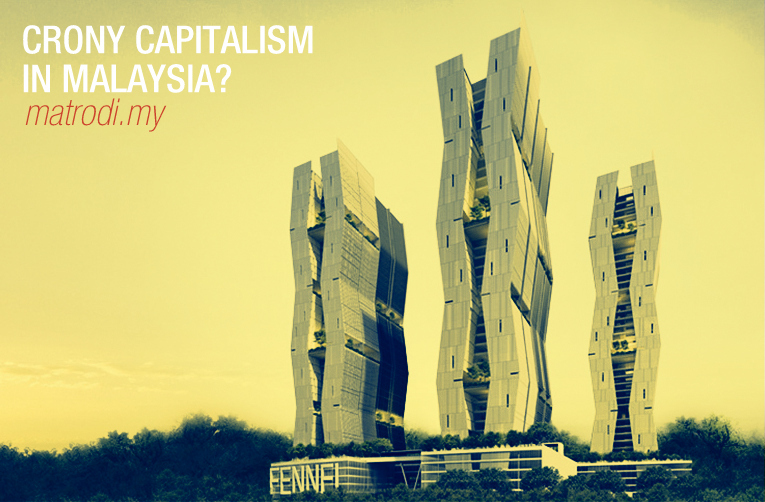 Malaysia- the much critcised country by some of the billionaires, gave them the head-start on their journey to wealth. They made their first million in Malaysia. Whether they want to admit or not, the facts stand. We keep repeating the same mistakes. We only have ourselves to blame. Giving projects to YTL and what do we get? I bet all their employees vote the oppositions. Enough is enough. Get rid of the people that supports them! I don’t want to sound bitter but certainly Francis Yeoh has one thing in common with the Malays. His is a version of “China mudah lupa “. Tun M always say Melayu mudah pupa. But Francis is one that choose to lupa.